The last game in the operational level The Italian Campaign Series Sicily- #146, Salerno-#150, Anzio-#155 and Med War). This game adds a strategic map of the Mediterranean Sea around Italy and adds all the major naval and air units to the counter mix for the Italian Campaign game set. Naval and air operations precede land operations during each game turn. There will usually be a variable number of air/naval “Pre-Game Turns” determined by the Allied player in each scenario. 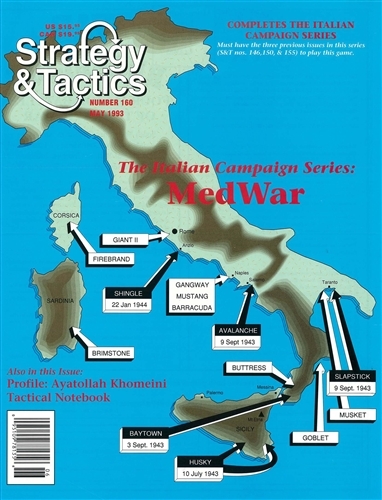 Numerous scenarios and campaign games are provided. Each one uses counters and maps from all of the preceding games in the series. Victory is determined by the scenario being played. The game cannot be played by itself; ownership of Sicily, Salerno, and Anzio, are required.